Garrett County. The Baltimore and Ohio built the roads to Broad Ford and Mountain Lake Park, and the mountain road to Loch Lynn, and maintained them as good dirt roads in summer for the use of the guests. In winter no one expected the roads to be kept open or free from snow, as the sleds and sleighs went right through or over the snow. In spring and late fall mud and ruts were taken for granted. In the late 1890's, when golf was beginning to catch the fancy of the sportsmen of America, a course of nine holes was laid out on the grounds in front of the hotel. In 1916 this was enlarged to 18 holes, making it a moderately difficult course. To the boys of Deer Park and the nearby country, caddying brought money for many things that otherwise would have been unattainable. A beautiful grove surrounded the hotel and cottages, all of which were connected by a network of carefully tended walks covered with aromatic and resilient red tanbark from the tanneries—a byproduct now unknown. A fountain, surrounded by flowers and shrubs, sparkled in front of the Main Building in the sun by day and in the brilliance of the arc lights at night. Huge American and DEER PARK HOTEL flags waved from 85 foot poles on the lawn. 24 hour telegraph service, supplemented by long distance telephone when such service became available, kept the clientele in constant touch with the rest of the world. 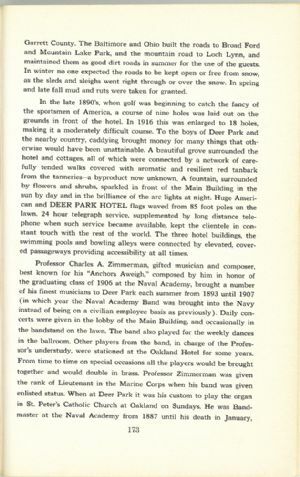 The three hotel buildings, the swimming pools and bowling alleys were connected by elevated, covered passageways providing accessibility at all times.